- S0C: Young Generation第一个survivor space的内存大小 (kB). - S1C: Young Generation第二个survivor space的内存大小 (kB). - S0U: Young Generation第一个Survivor space当前已使用的内存大小 (kB). - S1U: Young Generation第二个Survivor space当前已经使用的内存大小 (kB). - EC: Young Generation中eden space的内存大小 (kB). - EU: Young Generation中Eden space当前已使用的内存大小 (kB). - OC: Old Generation的内存大小 (kB). - OU: Old Generation当前已使用的内存大小 (kB). - PU: Permanent Generation当前已使用的内存大小 (kB). - YGCT: 从启动到采样时Young Generation GC所用的时间 (s). - FGC: 从启动到采样时Old Generation GC的次数. 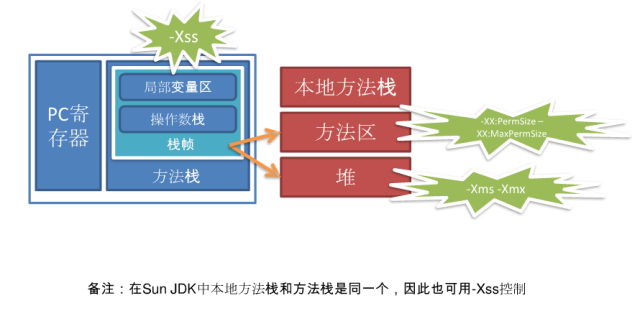 - FGCT: 从启动到采样时Old Generation GC所用的时间 (s).